The Franco-Syrian Treaty of Independence, also known as the Viénot Accords, was a treaty negotiated between France and Syria to provide for Syrian independence from French authority. In 1934, France attempted to impose a treaty of independence that was heavily prejudiced in its favor. It promised gradual independence but kept the Syrian Mountains under French control. The Syrian head of state at the time was a French puppet, Muhammad 'Ali Bay al-'Abid. Fierce opposition to this treaty was spearheaded by senior nationalist and parliamentarian Hashim al-Atassi, who called for a sixty-day strike in protest. Atassi's political coalition, the National Bloc, mobilized massive popular support for his call. Riots and demonstrations raged, and the economy came to a standstill. The new Popular Front-led French government then agreed to recognize the National Bloc as the sole legitimate representative of the Syrian people and invited Hashim al-Atassi to independence negotiations in Paris. He traveled there on March 22, 1936, heading a senior Bloc delegation. The resulting treaty called for immediate recognition of Syrian independence as a sovereign republic, with full emancipation granted gradually over a 25–year period. The treaty guaranteed incorporation of previously autonomous Druze and Alawite regions into Greater Syria, but not Lebanon, with which France signed a similar treaty in November. The treaty also promised curtailment of French intervention in Syrian domestic affairs as well as a reduction of French troops, personnel and military bases in Syria. In return, Syria pledged to support France in times of war, including the use of its air space, and to allow France to maintain two military bases on Syrian territory. Other political, economic and cultural provisions were included. Atassi returned to Syria in triumph on September 27, 1936 and was elected President of the Republic in November. The emerging threat of Adolf Hitler induced a fear of being outflanked by Nazi Germany if France relinquished its colonies in the Middle East. That, coupled with lingering imperialist inclinations in some levels of the French government, led France to reconsider its promises and refuse to ratify the treaty. Also, France ceded the province of Alexandretta, whose territory was guaranteed as part of Syria in the treaty, to Turkey. Riots again broke out, Atassi resigned, and Syrian independence was deferred until after World War II. Hashim Khalid al-Atassi was a Syrian nationalist and statesman and its President from 1936 to 1939, 1949 to 1951 and 1954 to 1955. Atassi, also spelled Atasi is the name of a prominent family in Homs, Syria, of a noble and ancient lineage, dating back to the 15th century AD. More recently, members of the family lead the national movement against the French mandate. The power and prestige of the family reached an apex at the formation of the modern Republic of Syria in 1936, when its second head of state, Hashim al-Atassi was elected president. Two out of the seven members of the constitutional assembly who drafted the first constitution of Syria in 1919 were prominent Atassis: Wasfi al-Atassi and Hashim al-Atassi. Two more scions, Lu'ay al-Atassi and Nureddin al-Atassi, were in turn installed as heads of state in the 1960s. Family members included magistrates, governors, ambassadors, heads of political parties, military officers and other public officials throughout Ottoman and modern times. 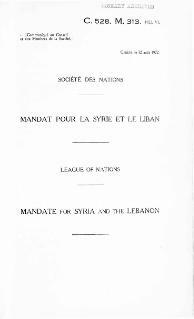 The Mandate for Syria and the Lebanon (1923−1946) was a League of Nations mandate founded after the First World War and the partitioning of the Ottoman Empire concerning Syria and Lebanon. The mandate system was supposed to differ from colonialism, with the governing country acting as a trustee until the inhabitants would be able to stand on their own. At that point, the mandate would terminate and an independent state would be born. Nazim al-Kudsi, also spelled "Koudsi", "al-Qudsi" or "al-Cudsi", was a Syrian politician who served as the President of Syria from December 14, 1961 to March 8, 1963. Ata Bey al-Ayyubi was an Ottoman civil servant. Born to a prominent political family in Damascus, Syria, he studied public administration in Istanbul, and began his professional career in the Ottoman civil service. Taj al-Din al-Hasani was a French-appointed Syrian leader and politician. He was born and raised into a family of Muslim scholars in Damascus. His father was Bader al-Din al-Hasani, one of the most respected Islamic scholars in the late nineteenth century. Lu'ay al-Atassi was a senior commander in the Syrian Army and later the President of Syria between 9 March and 27 July 1963. Izzat Husrieh was a renowned Syrian journalist, author, publisher and researcher. He contributed several books to the Arab library and his famous newspaper Al-Alam continued to form public opinion in Syria for two decades. Faris al-Khoury was a Syrian statesman, minister, prime minister, speaker of Parliament, and godfather of modern Syrian politics; born in Hasbaya in today's modern Lebanon. Faris Khoury went on to become prime minister of Syria from October 14, 1944, to October 1, 1945, and from October 1954 to February 13, 1955. Faris Koury's position as prime minister is, as of 2017, the highest political position a Syrian Christian has ever reached. Khoury's electoral popularity was due in part to his staunch secularist and nationalist policies. As a die-hard Syrian nationalist, Khoury never compromised on his principles and was resolutely against pan-Arabism and the ill-fated union between Syria and Egypt. Khoury opposed the short-lived union between Nasser's Egypt and republican Syria, the United Arab Republic. Through it all Faris Khoury served his country for almost 50 years. He was the grandfather of noted Syrian novelist Colette Khoury. Wasfi al-Atassi (1888–1933) was a Syrian nationalist, statesman and one of the original writers of the Syrian constitution. Jamil Mardam Bey, was a Syrian politician. He was born in Damascus to a prominent aristocratic Sunni Muslim family. He is descended from Ottoman's general, statesman and Grand Vizier Lala Mustafa Pasha. He studied at the school of Political Science in Paris and was a founder of Al-Fatat, the leading opposition party in Ottoman Syria. Sabri al-Asali was a Syrian politician and a three-time prime minister of Syria. He also served as vice-president of the United Arab Republic in 1958. The Arab Kingdom of Syria was a self-proclaimed, unrecognized state that began its independence as an "Emirate" after the withdrawal of the British forces from OETA East on 26 November 1919. The Syrian Republic was recognized as a sovereign state in 1945 and became de-facto independent in April 1946 from the French Mandate of Syria and Lebanon. In 1958, Syria joined with the Republic of Egypt in forming the United Arab Republic, though Syria withdrew from the union in 1961 and adopted the name Syrian Arab Republic. In 1963, the Syrian Ba'athist party came to power in the bloody military coup, which laid foundations for the political structure in Syria for the next decades. Lutfi al-Haffar (1891–1968) was a Syrian businessman and politician. He was a founding member of the National Bloc and served as 11th Prime Minister of Syria in 1939. Nasuhi al-Bukhari or Nasuh al-Boukhari was a Syrian soldier and politician who briefly served as Prime Minister of Syria in 1939. Nasib al-Bakri (1888–1966) was a Syrian politician and nationalist leader in the first half of the 20th century. He played a major role in establishing al-Fatat, an underground organization which sought the independence and unity of the Ottoman Empire's Arab territories. As the chief envoy between al-Fatat and the Hejaz-based Hashemites, al-Bakri became a close aide to Emir Faisal when the latter became King of Syria following the success of the 1916 Arab Revolt. Al-Bakri opposed the establishment of the French Mandate of Syria and became one of the chief commanders of the Great Syrian Revolt, leading the rebels' brief capture of Damascus. He escaped a death warrant in Syria in 1927, but returned the following year after being amnestied. The Syrian Republic, known as Mandatory Syrian Republic, or simply Mandatory Syria was formed in 1930 as a component of the French Mandate of Syria and Lebanon, succeeding the State of Syria. A treaty of independence was made in 1936 to grant independence to Syria and end official French rule, but the French parliament refused to accept the agreement. From 1940 to 1941, the Syrian Republic was under the control of Vichy France, and after the Allied invasion in 1941 gradually went on the path towards independence. The proclamation of independence took place in 1944, but only in October 1945 Syrian Republic was de-jure recognized by the United Nations; it became a de-facto sovereign state on 17 April 1946, with the withdrawal of French troops.